The Sunburst CMh system combines two of our most popular productsâthe Sunburst and Phantom CMhâinto a single unit that brings the benefits of ceramic metal halide lighting to all applications, small and large, in the Sunburstâs compact, all-in-one format. 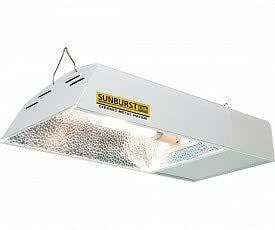 The Sunburst CMh has a built-in digital ballast designed specifically to run the 315W ceramic metal halide lamp, which in this system operates in the horizontal position. The reflectorâs interior is 95% European hammertone aluminum and offers excellent uniformity and diffusion. Choose between lamp color temperature options of 3100K (this item, SBCMH31531K) and 4200K (item SBCMH31542K).